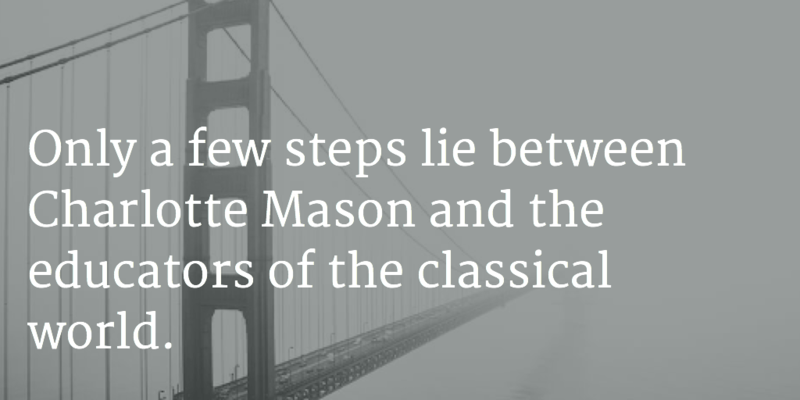 I was giving some thought recently to the links between Charlotte Mason and the classical educators and I was startled to realize that actually only a few steps lie between Charlotte Mason and the educators of the classical world. Many centuries separate Charlotte Mason, who has not yet been dead for 100 years, and Plato and Aristotle of Greek or Quintilian and Augustine of Rome. And yet…these names which loom large in the history of education are not succeeded by generations and generations of similarly significant contributors. On the contrary, during the Renaissance, those who wrote about education supported their precepts by skipping most of the Medieval teachers and making reference to the ancient Greek and Roman educators. Milton, Montaigne, Comenius, and Erasmus, and in fact, every Renaissance-era educator I have read, supported their ideas by quoting the likes of Plato, Isocrates, or Quintilian, whose name virtually stands for excellence in education. In other words, there is only a single step (albeit a rather long one) between the classical and Renaissance educators. When Charlotte Mason was forming her own ideas about education, she stepped over the Enlightenment educators such as Rousseau, Spenser, and Locke, and lifted much of her inspiration from the Renaissance educators. We know she borrowed Comenius’ desire for “a liberal education for all,” praised Milton for making magnanimity the object of education, and gleaned ideas about teaching directly from Montaigne. While she was familiar with her contemporaries, and acknowledged their contributions when she could, her active desire was for a second Renaissance–a return to the classical ideals, particularly a love of knowledge. And that’s just one more step–from the Renaissance to 19th/20th century educator Charlotte Mason. So, while it might seem startling to link a modern educator who is rightly called a visionary and a reformer with ancient historical educators, it is in fact a fairly short chain of links–a few steps, and no more. Such is the history of education, and for the interested student (assuming one is already familiar with Charlotte Mason’s writings), there is no better place to begin than with the Renaissance-era educators. In them, we find the words of the Greek and Roman teachers, and a concerted effort to apply sound and Christian principles to what was (for them) modern education. We are doing the same thing today.